Today, we live in a digital age, and social media keeps rising because it acts as a driving force behind many brands. So why not launch your personal brand’s campaign using social media? On Wednesday, Sept. 25, David Yarus, general manger at Mr. Youth (MRY) in New York City, spoke to Rowan’s AJF-PRSSA via Google Hangout and Twitter chat about how to land your dream job using social media. However, this was neither an ordinary virtual presentation nor Twitter chat. While Yarus presented to us on the “Hangout,” members freely — but sequentially — tweeted their questions using the hashtag #MRYAJF. AJF-PRSSA’s Communication Director Kelly Nguyen and I monitored the hashtag via TweetChat, asked Yarus selected questions during Q&A, and then tweeted Yarus’ answers. Essentially, we created a free-flow Twitter chat and a digital-on-steroids presentation. 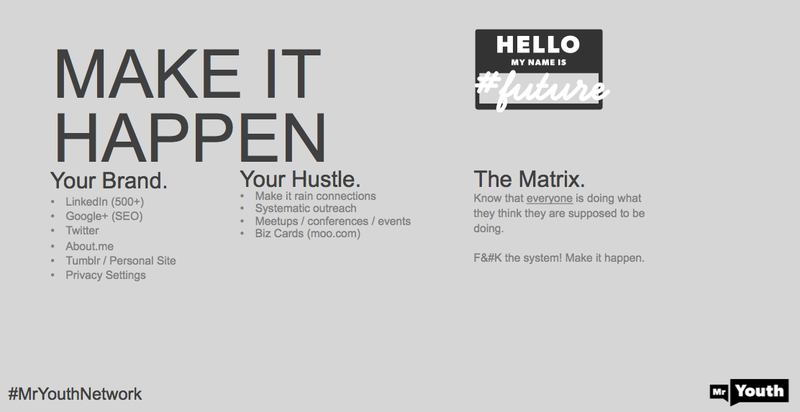 Add “ballerness” and “sexyness” to your brand across all platforms. Remember the movie “The Matrix” and break free from the system. Add an attractive and consistent one-liner to all your social media platforms. Make sure it’s alluring enough to grab someone’s attention. 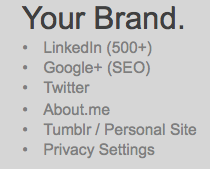 Don’t put your LinkedIn site address on your Twitter — you’ll look desperate. Use About.me instead. Your business card, resume and LinkedIn are your calling cards. They should mirror one another. Use Twitter to reach out to the CEOs of your dream companies. “Date them,” professionally and virtually of course. Find out about industry presentations, conferences and events. Go to them. And if you can’t afford them, volunteer to help and possibly attend for free. Make business cards. Hand them out at any chance you get. Know that everyone thinks they are doing what they should be doing to land a job. So, “Screw the system and just make it happen.” Tackle your job search with strategies and tactics that work best for you and your brand. Show your personality. Build a brand campaign for yourself. What makes you unique? Use the answer to that question to sell your brand. Create or update your blog. Write about anything. Be real and cohesive on your blog, Twitter and other social channels. Use your best judgement about where the line blurs between professional and personal. But as long as you showcase your personality, your creativity and your expertise on a subject — you will be fine. Landing your dream job using social media is a hot topic. A recent article in USA Today highlights how Mike Montano used the Internet to his advantage during his career search, and how he created a social media campaign called “Hire Mike” to land his current job. Using social media to land your dream job works if you do it right. 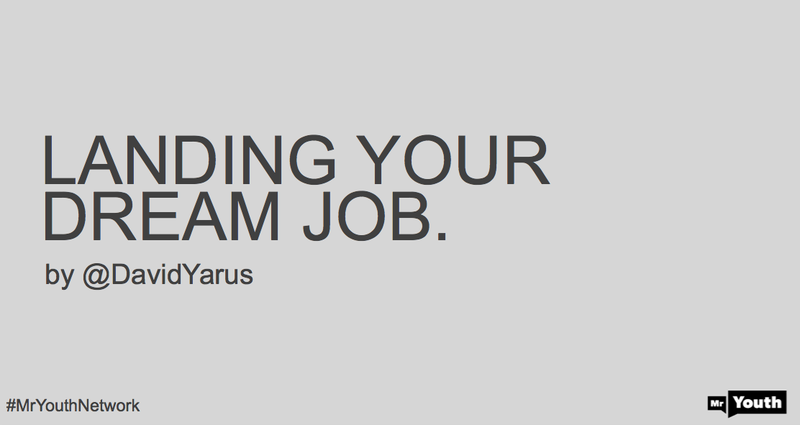 So — to kickstart your dream job and social media campaign — use Yarus’ advice and take advantage of social media tools and skills you have at your finger tips. This entry was posted in Career Search, Networking, PRSSA, Strategic Communication, Tips & Advice, Uncategorized and tagged About.me, AJF-PRSSA, blog, brand, brand campaign, business cards, campaign, CEO, David Yarus, digital age, dream job, Google Hangout, Hire Mike, LinkedIn, Mike Montano, Mr. Youth, MRY, New York City, person brand, Rowan, Rowan PRSSA, social media, social media campaign, strategies, tactics, The Matrix, Tweetchat, Twitter, Twitter chat, USA Today. Bookmark the permalink.